Guildford Poyle Charities is a registered charity that helps people in need by giving grants to individuals and to organisations helping them. 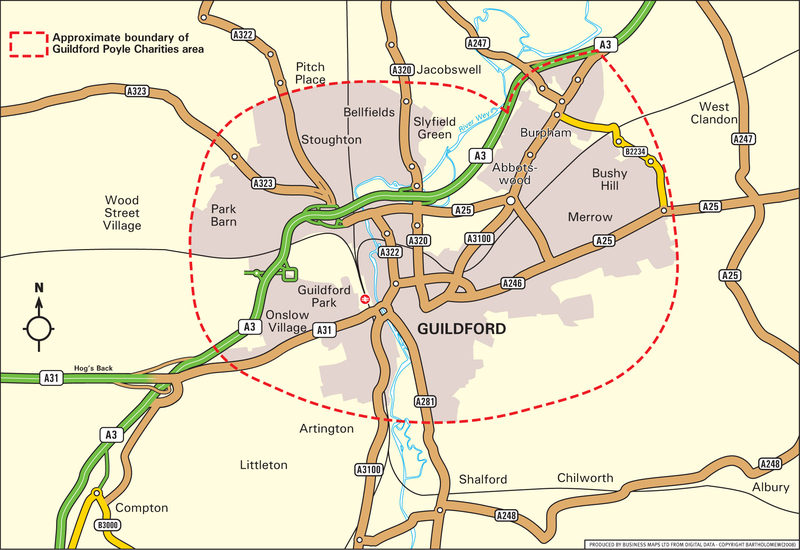 To be eligible for a grant, you must live in the central area of Guildford – see map below for area covered. To find out more about grants for individuals click here or use the menu on the left. To find out more about grants to organisations click here or use the menu on the left. By submitting an application you consent to the information you provide being processed by the charity. You also consent to us contacting your referee. The information that you give us together with any supplementary information that you and your referee give us by email, letter or telephone will be presented to the awarding committee of trustees. We will keep your personal information securely in electronic form for up to seven years and in paper form for up to three years from your last contact with us. Other than our contact with your referee we do not allow information identifiable to you to go outside the charity.